Aging is comprised of a number of distinct processes known collectively as hallmarks of aging (1). 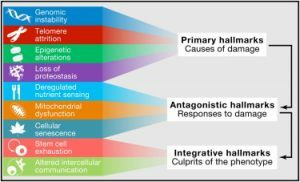 One of these hallmarks is cellular senescence and is one of the processes that cause our body to age leading to age-related diseases. As you age increasing numbers of your cells become dysfunctional and enter a nondividing state known as senescence. Senescent cells are no longer capable of cell division and they do not support the tissue they are part of. Instead they secrete a cocktail of harmful pro-inflammatory chemical signals that inhibit tissue repair and drive chronic inflammation. Based on the above it is tempting to consider cell senescence as being a bad thing but it really is not that black and white. Senescence is actually a safety measure that prevents the propagation of damaged cells that could potentially cause cancer. Once damage is detected cellular senescence shuts down the cell causing it to enter a self destruct program known as apoptosis. After this process is completed the immune system then disposes and recycles the cell materials using it to create new healthy cells. So really cellular senescence is generally a good thing as it keeps us safe from damaged cells causing cancer and also supports healthy tissue repair (2). Normally senescent cells are removed and recycled by the immune system but as we age this too begins to decline and more and more senescent cells escape this housekeeping process. It is at that point that cellular senescence ceases being beneficial and protecting us and becomes a driver of the aging process. Non-dividing cells would not be a problem themselves but unfortunately the secreted pro-inflammatory chemicals they express also encourage nearby healthy cells to enter the same senescent state. Collectively this cocktail of chemicals is known as the senescence-associated secretory phenotype (SASP) and has been the focus of much research (3). Indeed this phenomena has lead researchers to coin the phrase “good citizens but bad neighbors” when discussing senescent cells. SASP inhibits a number of important cellular processes, prevents effective tissue repair, contributes to chronic background inflammation and is implicated in the onset of age-related diseases (4-5). The levels of senescent cells are small, showing no more than 15 percent of cells in tested tissues were senescent during studies on primates (6). However their ability to cause damage far outweighs their relatively low numbers and only a small amount of them can cause major problems. Just when you thought senescent cells were bad enough, as well as the above problems they also contribute to a second hallmark of aging: altered intercellular communication. This is the age-associated low-grade chronic inflammation many researchers call “inflammaging” and is another hallmark of the aging process. Inflammaging is caused by a variety of sources including infectious burden, cell debris, excessive activation of the NF-kB protein complex (regulator of the immune response) and senescent cell SASP. Inflammaging is distinct to acute inflammation as it is a constant and relentless low-grade chronic level of background inflammation. It is implicated in the onset of various age-related diseases and poses a serious risk to our health as we age. Inflammaging interferes with intracellular signalling and contributes to the loss of regenerative capacity in stem cells and tissues. So as we can see, senescent cells are a problem when they accumulate in high numbers and reach the tipping point from being beneficial to becoming detrimental. Due to all these negative consequences of senescent cells it is probably no surprise that science is seeking solutions to the problem. One popular approach is periodically removing them from the body to compensate for the failing immune system, kind of like taking out the trash. This has the potential to delay or even prevent the onset of age-related diseases and has been the focus of intense research efforts in the last few years. Therapies that remove senescent cells are known collectively as senolytics and it just so happens that quercetin is one such supplement that might do that. Today we are going to take a look at some senolytic research and see how quercetin has been tested for senescent cell clearance (7). This was the study that ignited wide interest in the research community for senescent cell clearance as a potential way to treat age-related diseases. In the study the research team initially tested their hypothesis that quercetin and cancer drug Dasatinib could induce apoptosis in senescent cells, either individually or in a combination together. They compared the gene expression profiles of senescent and normal cells using transcription analysis in preadipocytes (fat cell progenitors) as these are very common cell types found throughout the body. The research team divided the cell culture in half inducing senescence in one one group and leaving the other as a baseline. Twenty-five days into the experiment they analyzed the gene expression profiles of both cell groups. When they compared the two sets of cells they noticed that gene expression profiles were significantly different between senescent and normal healthy cells. Analysis revealed that there was an increase of antiapoptotic gene expression in the senescent cells, this meant that these cells were actively resisting cell death and subsequent disposal. The researchers then tested quercetin and Dasatinib both singly and in combination in an attempt to remove the senescent cells by blocking the antiapoptotic gene expression. In the study, quercetin showed a greater effect against both senescent human endothelial cells and senescent mouse bone marrow mesenchymal stem cells, while dasatinib was able to remove senescent human fat cell progenitors. The combination of quercetin and dasatinib also eliminated senescent mouse embryonic fibroblasts by inducing apoptosis. Fig. 1 Dasatinib and quercetin reduce senescent cell abundance in mice. (A) Effect of D (250 nm), Q (50 μm), or D+Q on levels of senescent Ercc1-deficient murine embryonic fibroblasts (MEFs). Cells were exposed to drugs for 48 h prior to analysis of SA-βGal+ cells using C12FDG. The data shown are means ± SEM of three replicates, ***P < 0.005; t-test. (B) Effect of D (500 nM), Q (100 μm), and D+Q on senescent bone marrow-derived mesenchymal stem cells (BM-MSCs) from progeroid Ercc1−/Δ mice. The senescent MSCs were exposed to the drugs for 48 h prior to analysis of SA-βGal activity. The data shown are means ± SEM of three replicates. **P < 0.001; anova. The researchers tested quercetin and Dasatinib in mice again, both in combination together and singly. As before the two agents had stronger influence over different types of cells with quercetin being better at affecting endothelial and bone marrow stem cells and Dasatinib being better against fat cell progenitors. The two agents combined were moderately more effective than each individually suggesting some level of synergy. 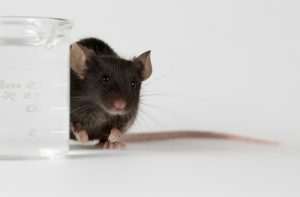 Old mice given a single dose of these senolytics showed an improvement in cardiovascular function within only five days. The healthspan was also extended in progeric mice (accelerated aging) that were periodically given the drugs, with the age-related symptoms of spine degeneration and osteoporosis delayed. The dose of quercetin used in this study was 50 mg/kg body weight in mice given weekly. Using the FDA’s “Estimating the Maximum Safe Starting Dose in Initial Clinical Trials for Therapeutics in Adult Healthy Volunteers”, that would be around 283 mg for a 70 kg (154 lb) person. This is considered to be a safe dose, and many supplements already use this amount or more on a daily basis, 500 mg being a fairly typical quercetin dose in supplements. Quercetin and its stronger derivative isoquercetin are both available at reasonably low cost over the counter. The amount of dasatinib given weekly to the mice was 5 mg/kg body weight which is around 28 mg for a 154 lb person. However, there are so many adverse side effects reported with dasatinib that its use should not be considered. Using it carries significant risks to health and therefore it is strongly recommended that you avoid using this particular drug. Dasatinib is also extremely expensive and is a controlled drug in addition to the high risk of dangerous side effects. A 2016 study built upon the results of this first study and included a number of researchers from the previous experiment (8). Whilst the original study suggested that a single dose of senolytics might improve vasomotor function the long term impact was unknown. They decided to see what long-term senolytic treatment did for vascular health using the same combination of dasatinib and quercetin in aged or hypercholesterolemic mice with cardiovascular disease. They found that senolytic treatment significantly improved vasomotor function in their mouse test groups which due to an increase in nitric oxide bioavailability. They also found that clearing senescent cells reduced aortic calcification and osteogenic signalling in both aged and hypercholesterolemic mice. They noted that there was no signifiacant effect on intimal plaque fibrosis by treatment. The study was the first to demonstrate that the long term use of senolytics to remove senescent cells does improve cardiovascular health in a number of important ways. This research suggests that senolytics could be a viable therapy to reduce morbidity from cardiovascular diseases. Quercetin once again proved to be safe and potentially useful in treating age-related diseases. Whilst researchers search for more powerful senolytic agents with less side effects than dasatinib it may we be worth considering taking quercetin. Given that quercetin was almost as effective as both agents combined it makes taking that alone a safe and reasonable proposition for reducing senescent cell accumulation and maintaining health. (2) Demaria, M., Ohtani, N., Youssef, S. A., Rodier, F., Toussaint, W., Mitchell, J. R., … & Hoeijmakers, J. H. (2014). An essential role for senescent cells in optimal wound healing through secretion of PDGF-AA. Developmental cell, 31(6), 722-733. (3) Coppé, J. P., Desprez, P. Y., Krtolica, A., & Campisi, J. (2010). The senescence-associated secretory phenotype: the dark side of tumor suppression. Annual Review of Pathological Mechanical Disease, 5, 99-118. (4) Coppé, J.-P., Desprez, P.-Y., Krtolica, A., & Campisi, J. (2010). The Senescence-Associated Secretory Phenotype: The Dark Side of Tumor Suppression. Annual Review of Pathology, 5, 99–118. (5) Freund, A., Orjalo, A. V., Desprez, P.-Y., & Campisi, J. (2010). Inflammatory Networks during Cellular Senescence: Causes and Consequences. Trends in Molecular Medicine, 16(5), 238–246. (6) Jeyapalan JC, Ferreira M, Sedivy JM, Herbig U. Accumulation of senescent cells in mitotic tissue of aging primates. Mech Ageing Dev. 2007 Jan;128(1):36-44. Epub 2006 Nov 20. PubMed PMID: 17116315; PubMed Central PMCID: PMC3654105. (7) Zhu, Y., Tchkonia, T., Pirtskhalava, T., Gower, A. C., Ding, H., Giorgadze, N., … & O’Hara, S. P. (2015). The Achilles’ heel of senescent cells: from transcriptome to senolytic drugs. Aging cell, 14(4), 644-658. (8) Roos, C. M., Zhang, B., Palmer, A. K., Ogrodnik, M. B., Pirtskhalava, T., Thalji, N. M., … & Zhu, Y. (2016). Chronic senolytic treatment alleviates established vasomotor dysfunction in aged or atherosclerotic mice. Aging Cell, 15(5), 973-977.